First, I had a second thought on trying this product because it's a gel form. I already tried some gel form skincare but I find it greasy. Some of the products I tried doesn't work for me so I was skeptical at first, but since iwhite korea aqua moisturizing was really good I give this a try. I bought this product with their Before Makeup Mask so I got this totally free because it says on the packaging save 25pesos. If you buy this in a sachet it retails 25 pesos on some nearest drugstore. I got mine from PureGold. As you can see above, the packaging is really cute. 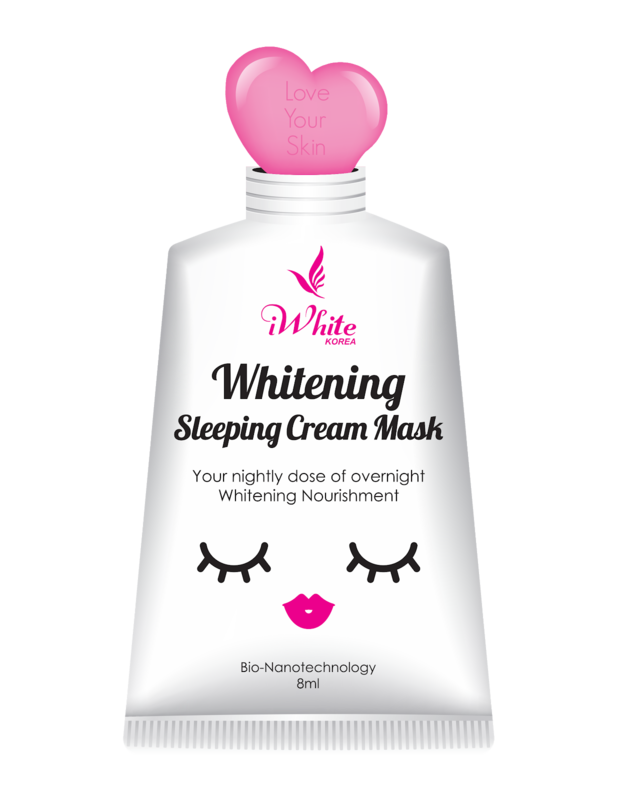 Plus the details on the packaging says "Whitening Sleeping Cream Mask" If you love skincare I am sure you will find it promising. The iWhite Korea Whitening Sleeping Cream Mask enriches your skin during sleep with active lightening and rejuvenating ingredients for a deep overnight skin nourishing experience. Your nightly dose of overnight Whitening Nourishment. Niacinamide (Vitamin B3) - Brightens skin tone while reviving skin’s healthy texture. Bamboo Sap extracts - Provides intensive hydration to deep layers of the skin. Rich in Minerals and Amino acids. Arbutin - Gentle yet effective in lightening dark and uneven skin tone for all skin types. Jojoba seed oil - Calms and soothes the skin from inflammation, acne, and redness while it stimulates skin cell regeneration. All ingredients mostly are beneficial for skin lightening, whitening dark spots, skin rejuvenating, acne marks, and other blemishes. So if you have these skin problems this sleeping mask is great for you. Basically, I apply it on my face when I'm ready to sleep at night just after cleaning my face with my favorite eskinol + maxipeel cleanser. If you notice I had this big bump on the right side of my face and that's a fresh pimple I applied a thick amount of the gel on that part and you know what? It dries up my pimple in the morning. I'm so impressed! I must admit it works from other skincare product too but with this included in my night routine it really speeds up the result. Cyleina Organic Tomato Soap + EskinolMaxiPeel Cleanser + iWhite Sleeping Gel Mask all these products are perfect night skincare routine for acne prone skin. You can see the results by watching my video above. The video is in Tagalog. Overall guys, I like the mask. I love it! I'm going to use it regularly before bedtime and I will update here my after result soon. This product is a must-have by an acne-prone skin, try it and you'll see.